After Phil Foden made his debut against Feyenoord, Pep Guardiola said the teenager’s development is down to the player. 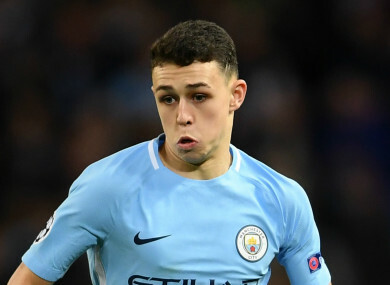 PEP GUARDIOLA BELIEVES the development of highly-rated Phil Foden is down to the teenager after he made his Manchester City debut in the Champions League on Tuesday. Foden, who played a starring role in England’s triumph at the Under-17 World Cup, came off the bench late in a 1-0 win over Feyenoord that confirmed top spot in Group F.
City also had a second academy product, Brahim Diaz, on the field at the end of the game as they brought up yet another victory in Guardiola’s 50th game in charge of the club. But after Raheem Sterling’s late strike ensured City stayed perfect in the group, Guardiola insisted Foden and Diaz will only play if they continue to prove themselves. Today is a special day for all of the club,” Guardiola told BT Sport. “The academy have worked so hard for the last couple of years and we had Phil Foden and Brahim Diaz on in the end. “They feel what it means to play in front of these fans. It depends on Phil now. He knows that the club, his team-mates and staff is there to support. Having confirmed top spot in Group F, and with matchday six’s game against Shakhtar Donetsk coming immediately before a derby Premier League clash with Manchester United, Guardiola was asked if he will play young talent like Foden and Diaz again. “We respect the competition, we respect Shakhtar and we respect Napoli,” Guardiola said. Of City’s battling performing in a tight match against a stubborn Feyenoord side, Guardiola added: “It was so difficult, so complicated to find the space. Sometimes it happens. Email “Man City fans get first sight of local star they crave”. Feedback on “Man City fans get first sight of local star they crave”.